Welcome back! If you made it through Part 1, then you know the kind of direction I'm taking this. If you didn't read Part 1, I'll catch you up really fast: I don't make direct recommendations, I just let you know the choices available so you can make your own educated decisions. Because if you give a man a fish, he eats for a day. If you teach a man to fish, he buys a boat and lies to his wife so he can go out and get drunk with his friends he eats for a little longer and then gets tired of fish. What? Where are we? Okay, let's just ignore that and jump right into this. PART 2: STAYING ON PROPERTY of the Walt Disney World Resort! The whimsical main pool of the Pop Century Resort. A Value Resort. The first thing that you need to know is the hotels in Disney World come in three different categories: Deluxe, Moderate, and Value. Deluxe is going to be your more costly, big fancy-pants hotels with extra amenities, restaurants, and things to do. Moderates are...moderate. Value hotels are the cheapest hotels available, but with a lack of amenities and extra features. And they all of the same theme of "Hey, giant whimsical plastic things!" And that's not necessarily a bad thing. I like big, plastic whimsy. Let's tackle transportation. There are three and a half main modes of free transportation around the Walt Disney World Resort. The main one is by bus. Buses stop at every hotel, park, and Downtown Disney. Need to get anywhere? Take a bus. It should be noted that buses don't travel from hotel to hotel. To get from one hotel to another, take a bus to a currently open park or Downtown Disney and transfer to a bus going to the hotel you're trying to get to. Buses are your easiest way around. Boats and Monorails at the Magic Kingdom! The second way to get around is by boat. There are a few thing to know, however. First, boats don't go everywhere, and they don't come from everywhere. They're mostly found around the Magic Kingdom and Epcot hotels, and also Hollywood Studios. Secondly, anyone singing the "I'm On a Boat" song immediately gets thrown overboard. By me. I won't stand for it. Cut that crap out. There's also a ferry from the Ticket Transportation Center to the Magic Kingdom front gates. But that's just a big boat. Noted? Noted. Moving on. 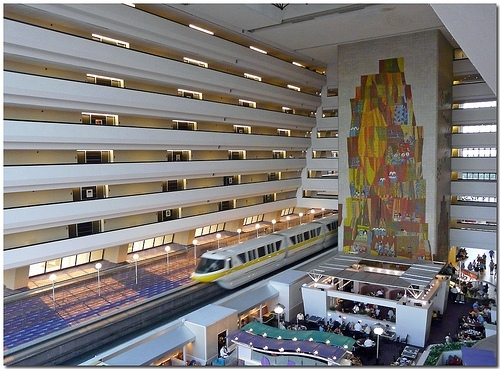 The Monorail has a stop INSIDE the Contemporary Resort! The third and coolest-looking way to get around is by... MONORAIL! I feel weird after what Josh said about it, but regardless of its staleness, there is something satisfying about it. It's a frikkin' monorail. 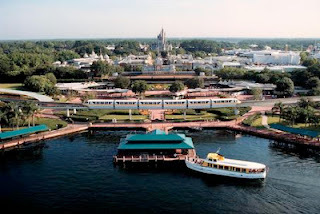 However, it only goes to three hotels (Contemporary, Polynesian, and Grand Floridian) as well as the Magic Kingdom and Epcot. Try it out if one of those are a destination for you. The half mode of transportation is your own two feet. You can't walk everywhere, but you can walk to the Magic Kingdom from the Contemporary Hotel. Also, you can walk to Epcot and Hollywood Studios from the hotels between those two parks. Sometimes it's a nice change of pace. Yeah, I can't say much about walking. It's walking. Woo. What about food? I like food. And it's essential for living. Thank goodness Disney has food at their hotels. The Deluxe hotels will have a small variety of well-themed table service restaurants or buffets, and a small food court tucked away somewhere that's damn near impossible to find. Moderate resorts will have one table-service restaurant and a food court that is much easier to find than the Deluxe ones. Value resorts have only food courts, and they're so big, you can't get away from them. Like black holes of deliciousness. Oddly, the Value food courts have a lot more variety to them than the higher class hotels, since it's the only place to get food at those particular hotels. It should also be noted that Value hotel doesn't mean Value food. The food is great at these places! Ribs, meatball sandwiches, salads, all sorts of goodness to shove in and around your face. Okay, I'm getting hungry, we better move on before I eat my keyboard. Food court at the Caribbean Beach Resort. A Moderate resort. Things to do! 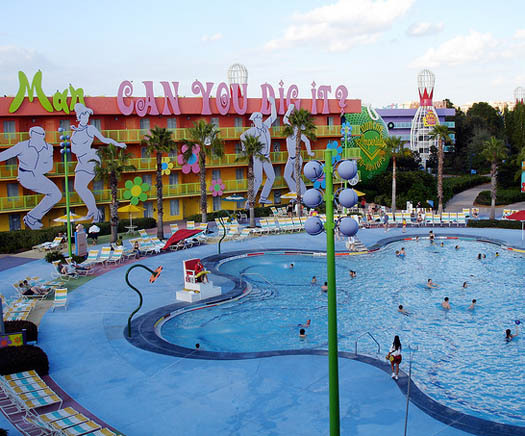 What is there to do at the various resorts on the Walt Disney World property? That, my friends, will have to be a whole other article, because there is way too much to quickly just jot down here. So there you have it. A brief guide to help you on your decision-making when making decisions on what hotel you want to stay at and the kinds of things that are available.